Log in to your account, create a new account, or checkout as a Guest. Follow the instructions as prompted through checkout. Ship to the Billing address or select “SHIP TO AN ALTERNATE ADDRESS” and complete the Shipping information. Please note that Christian Louboutin reserves the right to ship the order to the billing address. Complete the payment information using either a Credit Card or Paypal. 2. Can I change or amend my order once it has been placed? Please contact us via phone at +1 888 856 8247 (1888-8LOUBIS), to cancel or amend your online order as soon as possible. Order processing typically begins once the purchase is submitted. Therefore, it is not guaranteed that we will be able to accommodate your request. 3. Do you accept international credit cards? Unfortunately the online boutique is unable to accept international credit cards at this time. Your billing information and shipping information must be within the region you are shopping in. For example, all orders on CL Canada must have Canadian billing and shipping details, and the same respectively for CL United States. However, we do accept PayPal for your convenience. 4. What are the benefits of creating a Christian Louboutin Online Account? With a Christian Louboutin Online Account you can manage your personal information and complete checkout quickly using stored addresses. You can follow the progress of your online orders, access your online purchase history, and manage your Wishlist. Don’t forget to stay connected with all things LouboutinWorld by subscribing to our newsletter! 5. How do I retrieve my Christian Louboutin Online Account password? On the login page, click “FORGOT YOUR PASSWORD” and enter the email address associated to your Christian Louboutin online account. An email will be sent with a link to reset your password. You can also contact an online sales associate at +1-888-856-8247, to assist with resetting your password. 6. Why are some items listed as pre-order? We give our clients the opportunity to reserve an item before it becomes physically available online. The item is reserved for you and then charged and shipped automatically when the stock arrives at our warehouse. Pre-ordered items must be charged and shipped separately. Please note that product arrival dates are estimates and are not guaranteed due to varying production and shipment timeframes. We offer complimentary gift-wrapping on any shoe, accessory or handbag purchase. Simply select the gift-wrapping option during checkout, prior to entering your payment information online. For Beauty products, Christian Louboutin Beauty gift bags are available upon request. 8. Can I include a gift message with my order? If you select the option to have your order gift wrapped, you will also have the option to enter a small note to the gift recipient. Once gift wrap is selected, the invoice will automatically print without the prices showing. 9. How long does an item stay in my Shopping Bag? An item is not reserved while in your Shopping Bag but will remain visible as long as the stock is available online. To secure the item, you must complete the checkout process. 10. How many units of each product may I purchase on Christian Louboutin.com? Due to the limited nature of our merchandise, a maximum of three units per style can be purchased on a single order. Additional quantities beyond that can be purchased at the discretion of the boutique manager. 11. Can I purchase an online gift certificate? Gift certificates can only be purchased and redeemed at freestanding Christian Louboutin boutiques. Follow this link to locate your nearest store. 1. What are the shipping options and costs? Same Day orders are delivered between 2pm and 6pm, and must be signed for upon delivery. If the driver is unable to obtain a signature, a customer service representative will call to arrange another delivery, which will be subject to a fee. Alaska, Hawaii *Ground and Saturday delivery not available. Northwest Territories, Nunavut, Nova Scotia *Standard not available. 2. Will I need to sign for my order? All Ground and Expedited orders require an adult signature upon delivery. Beauty orders totaling less than $100 and shipped via UPS SurePost are delivered through USPS and will not require a signature (currently offered for US purchases only). Same Day Delivery is available only for US clients within Manhattan on Monday through Friday, provided the order is placed before 12 pm (EST). The delivery cost is $75.00. Same Day orders are delivered between 2pm and 6pm, and must be signed for upon delivery. If the driver is unable to obtain a signature, a customer service representative will call to arrange another delivery, which may be subject to a fee. 4. Where can I have my order shipped? Can I ship to a P.O. Box or APO/FPO address? We do not ship to Freight Forwarders, hotel locations, or any establishments at our discretion that may pose a risk to the security of the package. 5. Can I change my delivery address once my order has been dispatched? For security purposes, Christian Louboutin online orders are subject to thorough address verification. Therefore, once an order has shipped we are unable to make changes to the delivery address. If the address contains an error, please contact us via phone at +1-888-856-8247, as soon as possible. 6. When can I expect delivery of my order? Order processing begins as soon as the order is submitted. All orders are subject to review and Christian Louboutin may request additional identification information, which may take up to 24-48 in addition to your shipping time. 8. What happens if I miss the delivery of my package? If delivery of your order is unsuccessful, please contact us via phone at +1 888 856 8247 (1888-8LOUBIS), to arrange a will call at a local facility where you can pick up your package at a more convenient time. Please note that the pick-up location is predetermined by the shipping address zip code and the package will only be held for 5 business days. UPS requires a government issued photo ID and the name on the package must be the person picking it up. Christian Louboutin online boutiques only ship within the countries offered when selecting your region by clicking on the flag icon. All orders placed online within a selected region can only be billed and shipped to respective addresses; they cannot be processed internationally. All of our freestanding boutiques are able to ship domestically and to some countries internationally. Please use our Store Locator to find the boutique closest to you. Christian Louboutin accepts the following forms of payment for online purchases: Visa, MasterCard, American Express, Discover and PayPal. Christian Louboutin gift cards can only be used at our freestanding boutiques. Unfortunately, we do not accept pre-paid cards or manage multiple forms of payment for online purchases. Your credit card is charged in full once your order is processed for shipment. However, a $0.00 or $1.00 authorization may be held on your account until that time. 3. Can I use multiple forms of payment? Unfortunately, we are unable to process multiple forms of payment for online purchases. US state laws require that we charge applicable sales tax on orders shipped to any state where our corporation has a retail presence. Christian Louboutin is registered to collect sales and use taxes in all states which impose such a tax. Some states also assess sales tax on shipping and handling charges. Your sales tax will be automatically calculated and added to your order during checkout. The actual sales tax is calculated when your order is placed and may vary from the estimated tax. Canadian Provincial Sales Taxes (PST), Goods and Services Sale Tax (GST), and Harmonized Sales Tax (HST) will be collected on each order when applicable. PST, GST and HST are not applied to other Canadian taxes. Quebec Sales Tax (QST) will be calculated on all orders shipped to Quebec, and is based on the order’s retail value plus shipping. PST taxes will not be collected for Nunavut and Prince Edward Island; they are the responsibility of the customer. All taxes are calculated and listed separately and a sum value is indicated under Tax. 1. What is Christianlouboutin.com's return policy? How many days do I have to return an item? Christian Louboutin will accept merchandise in its original condition for refund/exchange when the order is postmarked for return within 14-days from delivery. Returned merchandise must be accompanied by the order Invoice, the original shoe box, dust bag, heel taps, and adhesive sole tags. Christian Louboutin reserves the right to refuse any return or exchange on merchandise that does not meet the above requirements. If your package is not accepted, it will be sent back to you and a refund cannot be granted. A direct exchange can only be facilitated for a different size of the same style, or for another item of the exact same value. An exchange is subject to availability of the requested item at the time of processing and we will do our best to ensure your request is satisfied. Should the requested item not be available to fulfill your exchange, a refund will be issued to the original form of payment. All exchange orders are shipped via free ground shipping. Please note we cannot facilitate a direct exchange on a PayPal transaction. An exchanged order can only be returned for a refund. 2. How do I return/exchange an order placed on Christianlouboutin.com? Log into your Christian Louboutin Online Account. On the Orders page, find the order you would like to return and click Create Return. If you checked out as a guest, create your return here by entering the email address on the original purchase and the order number. Select the item you wish to return and identify a return reason. If prompted, provide additional details regarding the return in the comment field. Once submitted, an RMA will be created and a confirmation will be sent to the email address on the original purchase. Download and Print the pre-paid return label. Affix the label to your Shipping Box; if using the original packaging be sure that the original label is fully removed or covered. Do not send shoes back with the Christian Louboutin box exposed. To Exchange for a different item or size, please return your original merchandise as per the above instructions and place a new order at your convenience. You will receive a refund for the returned merchandise once the item(s) has been received by our fulfillment center. 3. How long does it take for a refund to be issued? 4. Are delivery charges refundable? Shipping charges on your original order are non-refundable. We offer free return shipping with use of our prepaid return label. 5. Can I return/exchange my online order to a Christian Louboutin boutique? Online orders cannot be returned to Christian Louboutin boutiques at this time. All merchandise must be sent back to our warehouse facility in accordance with our policy. 6. Can I return or exchange an order I received as a gift? All online gift orders can be returned to our warehouse in accordance with our online return policy. The returned merchandise will be credited in the original form of payment. Online orders cannot be returned or exchanged to boutiques at this time. 7. What if my order is damaged upon receipt? We strongly advise all customers to check merchandise thoroughly upon delivery before removing the clear adhesive sole tags and before disposing of any original packaging. If you notice a defect or damage on your merchandise, please contact us immediately at +1-888-856-8247. In order to assess a claim, we often request photos of the damaged item and/or the original packaging. 8. What are refurbishment fees? Our red soles are very delicate and we cannot accept returns on shoes that appear worn or damaged. The red sole must be in perfect condition. Returning shoes of which the soles appear damaged may result in a refurbishment fee or may be refused if unable to be restored to sellable condition. If applicable, the fee is deducted from your return and the cost will vary based on the level of repair. To avoid causing any scuff marks or indentations to our soles while trying them on for fit, be sure to use a clean, carpeted surface. Sizing advice for Christian Louboutin shoes vary from style to style. Generally our shoes run true to size but as everyone’s feet differ, sizing preference depends solely on the wearer. The most common misconception when purchasing Christian Louboutin shoes is that a larger size will increase the width of the toe box and decrease the tightness of the material; when in actuality, going up in size only affects the length. Please keep in mind that none of our shoes are pre-stretched, but the majority of our materials will open up over time. After multiple wears, most materials will stretch and form to the shape of the wearer's foot, forming the perfect fit. To assist with sizing differences, our online specialists try on each style and provide general sizing advice on our website. Once you click on a product, you can find “Fit Suggestions” to the right side, above the size chart. To the left, the “Size Guide” shows direct conversions to Louboutin sizing. We provide these references to help you find the best fit, but should you have additional questions, please contact our experienced Client Services team for assistance at +1-888-856-8247, or you can email customerservice.usa@us.christianlouboutin.com for US and customerservice.ca@us.christianlouboutin.com for CA. 1. What should I do if an item I want is unavailable online? 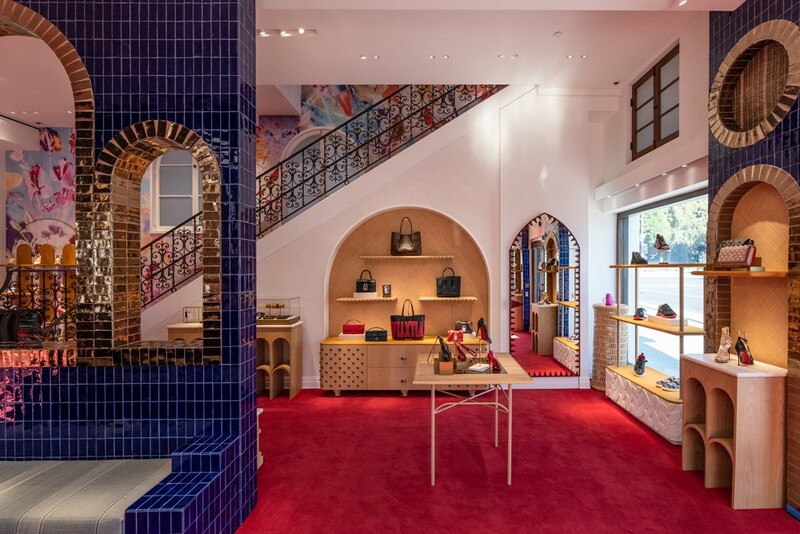 If the item you are interested in is sold out online, please contact us at +1-888-856-8247, or by sending an email to customerservice.usa@us.christianlouboutin.com, for US clients, or to customerservice.ca@us.christianlouboutin.com for CA clients, and a representative will check stock availability at our Christian Louboutin freestanding boutiques. Please note, our freestanding boutiques have different ordering and return policies than Christianlouboutin.com. All of our boutiques are able to ship domestically and to some countries internationally. Please inquire with a boutique directly for specific purchase and shipping policies that may apply. 2. How can I be informed when a product is back in stock? If a size is currently sold out but expected to be replenished online, you can subscribe via email to receive notification once the item becomes available. Notifications do not hold or reserve stock. To locate an item at a Christian Louboutin boutique, please contact client services at +1-888-856-8247. 3. Why are some items listed as pre-order? 4. Is my Christian Louboutin.com Wishlist reserved? Can I share my Christian Louboutin.com Wishlist? Once you sign into your Christian Louboutin Online Account, styles can be added to and removed from your Wishlist. Items on your Christian Louboutin Wishlist are not reserved but styles will remain visible as long as they are available online. Send a hint to your family or friends by sharing your Wishlist through one of our social media icons. 5. How many units of each product may I purchase on Christian Louboutin.com? 6. Where are Christian Louboutin products manufactured? Our skilled artisans handcraft all Christian Louboutin shoes and handbags in Europe, specifically in Italy and Spain. Christian Louboutin Beauty products are produced in the United States, France and Germany. 7. What is a Special Order? A Special Order is a request for a shoe that is not offered in our current collection. Through our Special Order Program, clients are able to request (from a pre-selected list of classic styles, materials, and colors) a shoe produced exclusively for them! Contact one of our freestanding boutiques for more information on the program. 8. How can I place a Special Order? Special Orders must be placed in-person at one of our freestanding boutiques. All requests are subject to availability and approval by the Christian Louboutin head office. Contingent on materials and production, the process takes approximately 3-4 months or longer. Payment is due in full at the time of order and all sales on Special Order products are final. Should you have additional questions, please contact the Client Services team at +1 888 856 8247 (1888-8LOUBIS), or by emailing customerservice.usa@us.christianlouboutin.com, for US clients, or customerservice.ca@us.christianlouboutin.com, for CA clients. 1. How do I repair my signature Christian Louboutin Red Sole? Our trademark red soles are created by applying lacquer on top of classic European beige leather soles. Please be advised that the red sole will become worn, revealing the natural color of the European sole underneath. The red wearing off is not a defect and is expected to happen with use. If you are unhappy with the natural wear of our soles, they can be repainted with our signature red color. This is not an in-house service, however, we recommend several cobblers that have perfected these techniques as well as others to recover our soles. 2. How do I maintain my Christian Louboutin products? Always store your Christian Louboutin products away from light and heat. When not in use, store your footwear in the Christian Louboutin dust bag provided. 3. Where can I have my Christian Louboutin product repaired? Please note Christian Louboutin has made these recommendations solely as a courtesy to those wishing repair our products. Consumers who make use of these locations have the sole responsibility for evaluating the suitability of the locations, their operations and the results of any repairs conducted thereby. Christian Louboutin assumes no responsibility or liability related thereto and makes no representation or warranty regarding, and does not endorse or approve, these repair specialists, or any of the products or services they offer. If you would like advice on repair services, please contact the Client Services team at customerservice.usa@christianlouboutin.fr, for US clients, and customerservice.ca@christianlouboutin.fr, for CA clients. 4. Where can I find Christian Louboutin spare parts? Spare parts, such as heel taps and spikes, are typically included with your purchase. Should you require additional spare parts for your Christian Louboutin product(s), please contact the Client Services team at customerservice.usa@christianlouboutin.fr, for US clients, and customerservice.ca@christianlouboutin.fr, for CA clients. Please note that not all spare parts are able to be ordered. 5. Are your products covered under warranty? Christian Louboutin does not offer product warranties. Additionally, repairs are not free of charge unless considered appropriate by the Christian Louboutin head-office. 6. Where can I obtain Christian Louboutin shoe boxes or dust bags? Generally, our factory includes one Christian Louboutin dust bag per style. Two dust bags are included for styles in delicate fabrics, such as strass, glitter and pony hair. Shoe boxes are made per pair during production and unfortunately, we are unable to provide additional shoe boxes upon request. To stay up-to-date on everything Christian Louboutin, subscribe to our “Newsletter” through your account. Use the hashtag #LouboutinWorld or #LouboutinHomme when wearing Monsieur Louboutin’s creations! To receive new arrivals from your local boutique, please contact us at customerservice.usa@us.christianlouboutin.com, for US clients, and customerservice.ca@us.christianlouboutin.com, for CA clients, to be added to their new arrivals lists. 2. How can I apply for a job at Christian Louboutin? For employment opportunities at Christian Louboutin, please visit our Christian Louboutin LinkedIn page. Alternatively, you can email your resume directly to ResumesTHEAMERICAS@us.christianlouboutin.com. 3. How do I open a wholesale account? Currently our wholesale team is not accepting new partners. You are welcome to email a presentation of your business to us at customerservice.usa@us.christianlouboutin.com for our US clients, and customerservice.ca@us.christianlouboutin.com for our CA clients. A representative will forward it to the wholesale department for future consideration. 4. What Is Christian Louboutin doing to combat counterfeit products? Our company is persistently combating the distribution of counterfeit Christian Louboutin products. Our legal team has a “zero tolerance” policy and has successfully removed countless websites selling counterfeit and infringing Christian Louboutin merchandise. Despite our constant efforts, websites appear and disappear every day. Therefore, we suggest you protect yourself by purchasing only via authorized retailers or directly with us. 5. How can I have an item authenticated? 6. How can I report a fake Christian Louboutin website? To report a website selling fake Christian Louboutin products, please visit the Stopfake dedeicated page and contact our Stopfake Team through the contact form or section of through the built-in proprietary online store checker. 1. Where are your Christian Louboutin boutiques located? Please use our Store Locator to find your nearest Christian Louboutin Boutique. Please note, we only list our freestanding boutiques and concessions; we are unable to provide a worldwide list of our wholesale partners. 2. Where can I purchase Christian Louboutin products? 3. How can I purchase a Christian Louboutin boutique gift certificate? Gift certificates are only available for purchase at our freestanding boutiques and can only be purchased in person. Please use our Store Locator to find the closest boutique to you. If you are in need of further assistance, please contact our dedicated Client Services team (known internally as the Loubi Angels), and they will be more than happy to provide you with the exceptional customer service Christian Louboutin is known for! Our team can be reached by phone at +1 888 856 8247 (1888-8LOUBIS), or by email at customerservice.usa@us.christianlouboutin.com for US clients, and customerservice.ca@us.christianlouboutin.com, for CA clients.